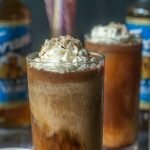 This German chocolate cake cold brew coffee is a great afternoon treat that you don't have to feel guilty about as it's sugar free and low carb! Toast your coconut flakes by adding to a dry skillet and toasting until browned. Make sure you continuously stir as they burn easily. To make the whipped coconut cream, spoon only the solid part of a can of coconut cream into a mixing bowl along with the S'mores syrup. Save the water for smoothies or discard. Using a hand mixer, beat the coconut cream until the consistency of whipped cream. In a shaker glass or blender, add the coffee, cocoa, Chocolate Macadamia Nut and Hazelnut syrups. Mix well and taste to see if it is sweet enough. Pour over ice and add coconut milk. Top with whipped coconut cream and sprinkle toasted coconut flakes on top.